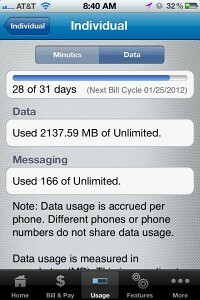 AT&T is now throttling customers on unlimited data plans after they've surpassed 2GBs of data use, reveals John Cozen. Cozen, an AT&T customer who had been grandfathered in to the 'unlimited' data plan with AT&T, was surprised to receive a high usage alert from the company after reaching only 2.1GB of data use. The alert informed him that he was in the top 5% of data users and would be subjected to near unusable speeds. Thinking there was a mistake he contacted AT&T where he was informed that anything over 2GB is top 5%. To give you a baseline - the average data use across the country by the top 5% of AT&T smartphone customers was 2GB per month, effective August 2011. This is a pretty despicable move by AT&T to stay within their legal requirement to offer 'unlimited' data but at speeds so slow that you would be better off switching to a tiered data plan.